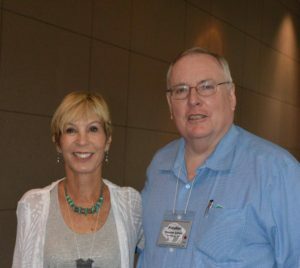 Over the years I have learned that being an author has its flattering moments, none more so for me than at my first Wild West History Association (WWHA) meeting this month in Oklahoma City. We went at the encouragement of Mike Cox, a longtime writer friend, Texas Rangers expert and editor of the association’s journal. When we met up in OKC with Mike and Beverly, he told me that a member of the board was anxious to meet me. So, at the opening reception I was seated at a table visiting with a newfound friend when I saw a woman out of the corner of my eye approach Mike and overheard her ask if I was there. Mike told her that was me sitting across the table from him and then escorted her over to meet me. Her name is Pamela Fuller Potter and she is a past president of WWHA from Mountain Center, California. Pam proceeded to tell me how much she loved Mix-Up at the O.K. Corral. Not only that, the book remains one of her favorite books of all time, especially fiction since she generally reads nonfiction. I was greatly flattered that she would remember the book since Mix-Up was published two decades ago this year and had a limited shelf-life as a mass market paperback from Bantam. As we talked, she explained the backstory. Her great grandmother was the younger sister of Tom and Frank McLaury, who along with Billy Clanton died in the shootout with the Earp Brothers and Doc Holliday at the O.K. Corral on October 26, 1881. Running a saloon is as respectable an occupation as, say, running for political office, and you get to meet a higher class of people. That’s how I met Doc Holliday, who threatened to cut out my gizzard, and Johnny Ringo, who offered to blow a hole in me wide enough to drive an ore wagon through, and the Earp brothers, who were rightly named because I always felt like throwing up around them. They made me that nervous because I never knew what side of anything they were on, save their own. When you write historical fiction as I do, you seldom remember that people long deceased often have living links to the present through their family descendants. My new friend Pam Potter reminded me of that. Later, I would meet kin on the other side of the fabled shootout, but that is a story for another day.